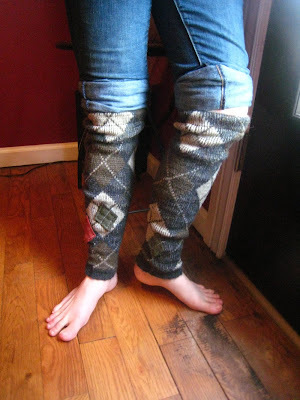 i never did get around to posting gifts i made over the holidays... things got so hectic and really, photographs were not as high on the priority list as shipping before 2010. but, i made three whole pairs of sweater -> leg warmers. the first was super quick, for the hand2mouth silent auction. i thought, i could definitely make a ton of these for my shop! the second was originally a gift for lanz, but they ended up going to our awesome mail lady. she wears a usps skirt every day and totally rocks it (i don't know if usps allows leg warmers). plus she picks up all my little etsy packages. i had a different inspiration for lanz's, so the others went out the door as soon as i saw the mail coming! lanz's leg warmers required a little repair of holes and such, but it was worth it. i used a sweater she had given me for re-crafting; it was her mother's, originally from greece! love leg warmers with history! i confidently boasted of my leg warmer skills to another friend, and then had the darnedest time making more. finally i dived in. i knew these red ones would be super simple with the ribbing. no elastic needed! but the edge was a little tricky because of that. i still think they are cute bell-bottom-y leg warmers, but i have no idea of their appeal to anyone else. nor would i know how to price them, since the sweater did most of the work itself. oh leg warmers, how you tease! this argyle pair had a huge number of elusive holes that i did not see until it was too late. i had gone too far, patched too much, and i was not going back. they're kinda scrappy and again, i don't exactly know how to handle that! are they marketable? will they wear well or get snagged? will the excessive patching make them super warm or super difficult to match to any other clothes? luckily, said friend, to whom i bragged, agreed to be a leg warmer tester. hopefully they are keeping her ankles toasty in the bitter chicago cold. and another lesson under my belt. 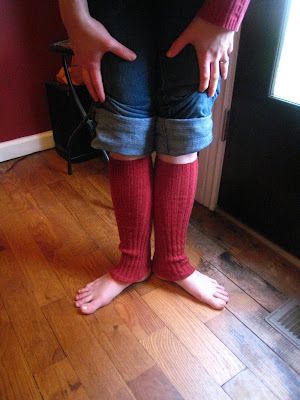 look before you leg warmer? two leg warmers on the legs are worth four in the head? (y'know, bird in the hand?). don't count your warmers before they're hatched? you get the idea. onward!